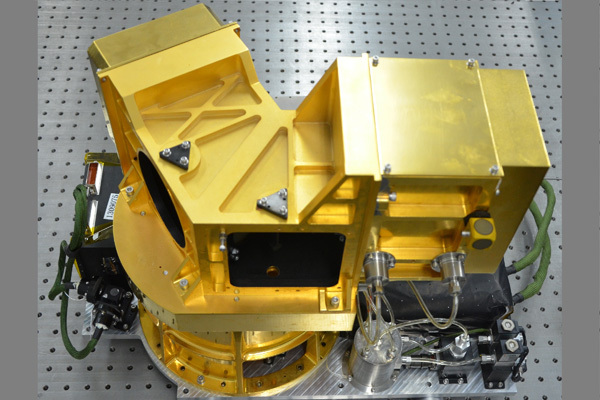 The interferometer of geostationary interferometric infrared sounder. As a main instrument onboard geostationary meteorological satellite FY-4, geostationary interferometric infrared sounder (GIIRS) is used to measure the infrared spectrum of the earth atmosphere. The spectrum is inverted by meteorologists to obtain three-dimensional distribution of humidity and temperature in the atmosphere and its variation with time. Traditional sounders, such as sounder of geostationary operational environmental satellite (GOES) in orbit and infrared atmospheric sounder of China's FY-3, detect the spectrum based on the on principle of optical filter. GIIRS is designed based on the principle of Fourier-transform spectroscopy. Its core component is interferometer and its spectral channels are more than 1600. And GIIRS has an optical imaging system which conjugates targets with sensing elements (SE). Using a N×M-dimensional SE to obtain interferogram signals, GIIRS can realize large area coverage dynamic sounding in short time which is very important for weather prediction. The primary user of GIIRS is China Meteorological Administration. By GIIRS, observation of air vertical flow is realized for the first time internationally. In addition, because GIIRS is a hyperspectral infrared sounder in reality with a spectral resolution of 0.625 cm-1, the field of application can also cover environmental monitoring, danger forecast and military etc. For the successful launch of geostationary interferometric infrared sounder, in November 2017, at the International Strategic Committee Meeting on Chinese Meteorological Satellite Programs held by WMO, WMO expert, conference chair, Dr. Tillmann Mohr pointed out: GIIRS, boarded on FY-4 satellite, make China be in the lead of atmospheric sounding on geostationary orbit in the world. From pre-research to the end of on-orbit test, the development process of GIIRS boarded on FY-4 satellite took 16 years. In the future, it will be loading the sequent satellites. The development of weather observation needs higher spatial resolution and time resolution, so the further research will focus on the key technologies of infrared SE arrays with large size.